Overiew: Papago springs near Rincon peak was probably originally built to ensure a year-round supply of water to cattle grazing on federal land in the vicinity. The large cistern and accompanying tank and windmill were erected in June of 1933, as the scribblings engraved into the concrete of the cistern indicate. The trail itself is actually a rough 4WD trail that begins at the Coronado National Forest boundary and winds a mile and a half into Coronado National Forest to Papago Springs. Although it is theoretically possible and completely legal to travel this trail by OHV, the endeavor would require one to be either very skilled or very foolish. Attempting it in a vehicle without excellent articulation and self-recovery gear would be a recipe for disaster. As such, the trail seems to see more equestrian use than foot or vehicle traffic. Hike: At the end of FSR 3541 sits a set of corrals and a an unlocked gate. The hike begins here. The trail almost immediately lets you know that it means business, sharply climbing and then descending into a drainage. The trail is easy to follow the entire way, but quickly becomes rocky and rutted. After following the drainage for a short distance, the trail climbs sharply out and onto a small ridge. This series of descending and climbing over small ridges is the basic pattern that the trail takes its entire course. After ascending a short hill, the trail drops into a wash and follows the wash for about 30 meters before climbing the east ridge of the wash and onto a rutted plateau. The trail skirts alongside Posta Quemada Canyon and nearly joins it once or twice. Rincon peak now comes into detailed view to the northeast. From here, the trail begins to gain elevation slowly and steadily, remaining rocky and rutted the entire way. This continues for roughly a half-mile before the trail turns sharply north and then begins to descend into the canyon at a sharp grade. This final section of trail is steep, rocky, and quite rutted. The windmill at Papago Springs is now visible ahead, as is the large concrete cistern to its north. After reaching the canyon bottom the walk to the spring is short and easy. The spring is surrounded by a mesquite bosque and numerous footings from old structures exist to explore. A large, heavily-weathered steel tank rests uphill from the cistern, and the windmill appears to still be functioning in its pumping capacity. The views of Rincon peak from here are quite extraordinary, as are the views of "Wrong" mountain. The Aliso Spring trail starts at the vehicle barrier near the weathered steel tank. Return to the corrals the way you came. 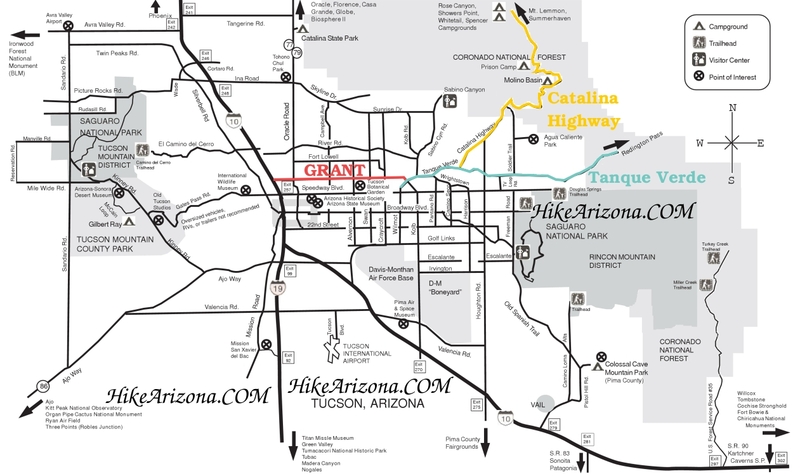 To reach the trail, get to Old Spanish Trail in east Tucson and take it east as if to go to Colossal Cave park. Roughly a mile and a half before reaching Colossal Cave, Old Spanish Trail meets south Pistol Hill road. To the south it is paved and to the north it is a dirt road. Turn left (north) and follow south Pistol Hill road for exactly 1.2 miles. At roughly one mile, begin looking to the right (east) of the road for a junction with another dirt road, this will be FSR 3541. Turn onto FSR 3541, an unimproved dirt road passable by passenger car, and continue east for another 1.3 miles until a small sign to the right of the road becomes visible at a fork up ahead. The sign points to the northeast and reads "National Forest." Turn left (northeast) here for the final four-tenths of a mile trip to the trailhead. This final section of FSR 3541 requires a high-clearance vehicle, but ample parking exists at this junction and the last stretch could be walked. The forest service boundary at the end of FSR 3541 is the parking area and initiation point for the hike. There is ample parking near the corrals.